DISTRIBUTION: Reticulated pythons can be found throughout Southeast Asia. Their range includes the Nicobar Islands, Burma through Indochina, and Borneo, Sulawesi, Ceram and Timor in the Malay archipelago. HABITAT: Steamy tropical rainforests near small rivers or ponds in tropical environments. 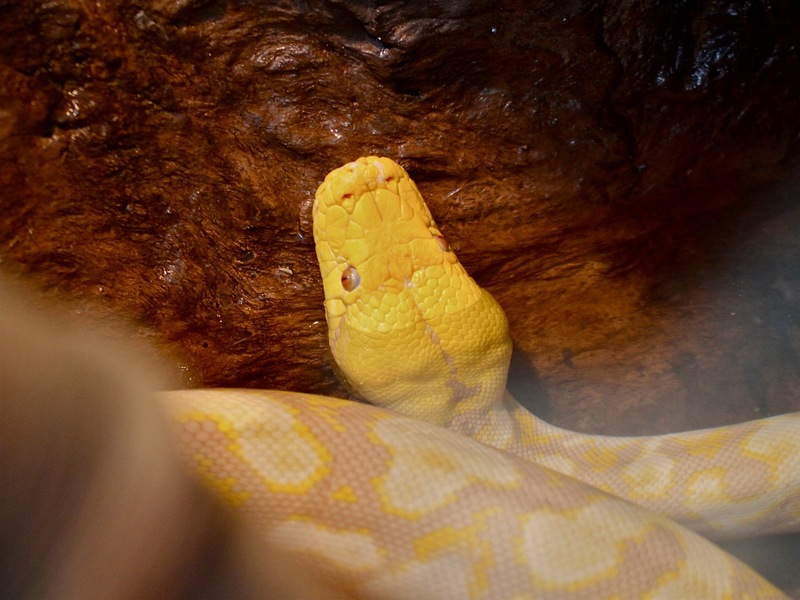 APPEARANCE: Normally colored reticulated pythons have several pigments: melanin (blacks), and xanthins (yellows) amongst other more subtle colors. Lemondrop is a “lavender albino” which is the same thing as a “tyrosinase positive albino” (t-positive) which have the inability to complete the synthesis of melanin but can produce other melanin related pigments such as various shades of brown, grey and red resulting the “lavender” color. 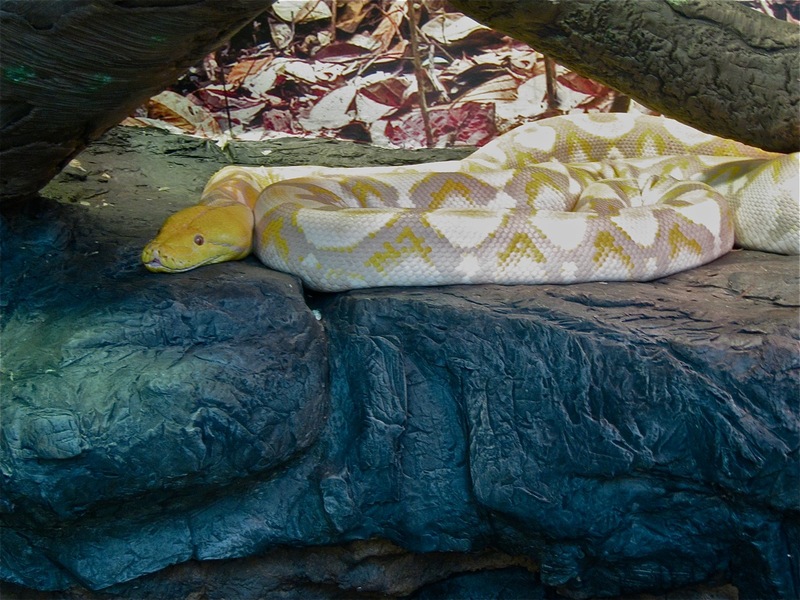 A “normal albino” (t-negative) reticulated python is yellow and white with pink/red eyes. Melanin and other melanin pigments areas are pure white but non-melanin pigments are present giving alternate colors (xanthines produce yellows). To make matters more complicated different albino snakes may have mutations giving them additional color morphs. DIET: P. reticulatus is strictly carnivorous swallowing their food whole with backward curved teeth (which are replaced if lost) preventing escape of a bitten prey. It typically feedis on birds and mammals but can extend to dogs, large deer, pigs and very rarely humans. They are usually ambush predators, waiting in trees for unsuspecting prey. P. reticulatus does not crush their prey but squeezes more tightly each time the prey exhales suffocating it or causing the heart to stop. REPRODUCTION: Lays 25-80 eggs and guards nest but not hatched young. I am taking the rainforest class and this is great photo plus useful information.